Bernard Cornwell has written another page-turning historical adventure featuring Lieutenant Richard Sharpe, a foot soldier in the Napoleonic Wars between France and Britain, this time during the campaign in northern Portugal in the spring of 1809. Sharpe is leading a very small company of riflemen cut off in Portugal from the main English army when French Marshall Soult takes the key city of Oporto, a key stepping stone to taking the capital Lisbon. While it is an almost impossible task to fight his way back to British lines, Sharpe is ordered to follow Lieutenant Colonel James Christopher (a Foreign Office agent) and find Kate Savage, a 19 year old English girl who has run away from her mother to a town under attack by the French. 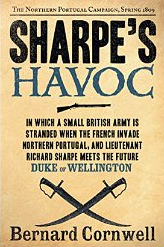 On the way Sharpe joins up with a group of 37 Portuguese soldiers who have also been cut off during the attack on Oporto. At last Sharpe is beginning to make his mark as an officer, despite the distrust of his peers of someone who was born into poverty and his troops towards someone who started out as a humble private. Sharpe achieved his promotion to an officer through bravery in the field and gets the respect of his troops through tough and skilful leadership under almost impossible conditions. Sharpe, his men and the Portuguese group fight their way out of danger against far superior French forces and track down the renegade Colonel Christopher who has suddenly become an ally of the French. Their only hope is that General Arthur Wellesley (the future Duke of Wellington) will arrive with relief forces in time to drive the French out of Portugal. This is another great adrenaline-filled page-turning authentic historical re-enactment with Richard Sharpe taking a front-seat role in the battles for the control of Portugal. I have resolved to read all of this brilliant series - so far I have read 9 with only 13 to go.